Comparison search engines only show you whose price is best in that instant. Now, at least one service finally has a tracker that lets you see what each retailer charged for gadgets over time. After I read about Gazaro on Consumerist, I signed up (free) and looked up the Nikon D90 and Panasonic's 50" TH-50PZ80U, which you can see tracked below at both Amazon and NewEgg. For the plasma, you'll notice that Amazon's pricing is better, but sadly, the historical data doesn't go back very far. It seems Amazon pricing only goes back to January 1, though NewEgg's goes back to last fall. As a new service, Gazaro will probably only get better as it accumulates more useful historical data. The prices do appear to include the low ones that are not always revealed on the page—Gazaro has up-to-date correct pricing on Amazon's merchandise despite the "click here to see price" obstacle. As you see above, you view the pricing as a graph, with rollover data points that reveal prices on certain arbitrary dates. But look below—sticklers for raw data can view it all in a chart. 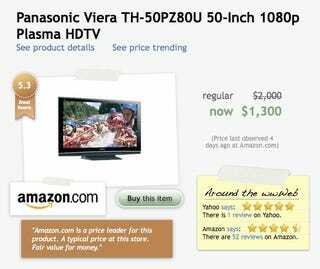 I know for a fact that I will hit up this site all the time when doing researching so-called good deals, because, like in the Amazon plasma-TV example above, even the "best" deals aren't as good some of the time as they are at other times. UPDATE: I'd also like to point out ZooLert as another option in this field—I am happy to see that this movement is gaining steam. It's great news for smart shoppers.